At home at the Henry Crown Field House, the University of Chicago men’s and women’s track and field teams began their seasons on the right foot with a dominating pair of wins at Saturday’s Phoenix Invitational track and field meet. Both teams took first in their respective fields by a wide margin, with the women’s team scoring 309 points to runner-up Aurora College’s 79.5 and the men capturing 290 points to second-place Aurora’s 72. This weekend’s meet was highlighted by stellar debut performances by both team’s newest members. On the men’s squad, first-year John McCormick took first in both long jump and triple jump with a pair of stellar leaps of 6.49 and 13.88 meters, respectively. First-year excellence continued in men’s distance running events, where Jonah Estabrook’s 5,000-meter (16:06.31), Henry Myers’s 1-mile (4:26.01), Dillon O’Loughlin’s 400-meter (51.29), Wilson Hansen’s 200-meter (22.96), and Sam Craig’s 3,000-meter (8:55.96) won each athlete first place in their college debuts. Meanwhile, on the women’s team, first-years Kaitlyn Van Baalen and Meg Fitzpatrick each took first place finishes with their 800-meter (2:21.83) and 400-meter dash (1:00.72), respectively. The first-years’ stellar debut performances were further rounded out by a strong showing by the team’s more veteran members. First-place performances for the Maroon men include third-year Alexander Scott and his 15.32 meters weight throw, fourth-year Owen Melia’s 800-meter (1:59.17), and the men’s 4x400-meter relay team—Tyson Miller, Elliot Paintsil, Ben Chaimberg, and Caden Kalinowski—who completed the event in 3:30.93. 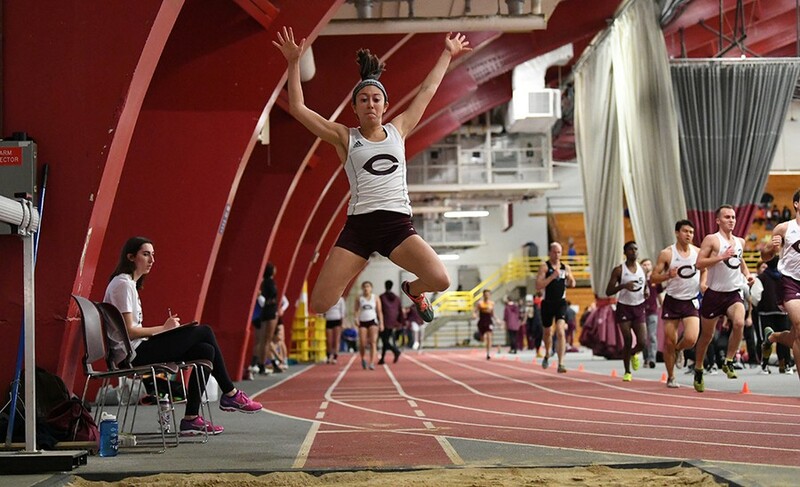 Meanwhile, event winners in women’s track and field include fourth-year jumpers Alexandra Thompson and Grace Penders, who leapt 1.64 meters in the high jump and 10.32 meters in the triple jump, respectively. On the track, third-year Mary Martin’s 200-meter (26.00), second-year Margaret Habib’s 5,000-meter (19:13.93), second-year Emma Dyer’s 1-mile (5:11.39), third-year Robin Peter’s 60-meter hurdles (9.27), and second-year Zoe Smith’s 3,000-meter (10:41.12) all proved to be first place performances. The woman’s relay team, consisting of Kaela Jolibois, Mary Martin, Tali Naibryf, and Alexandra Thompson, also took first place with a blistering 4x400-meter relay (4:11.98). The Maroons look to follow up their stellar start with a strong next step at Illinois Wesleyan University’s I-55 Triangular meet at 11 a.m. on Saturday, January 19.